This week, we are preparing ourselves for Lent, and so we discuss some creative ideas for ways to add prayer, fasting, and almsgiving during the 40 days between now and Easter. I really encourage women and families to add small things to their daily routines to set Lent apart from the rest of the liturgical year. 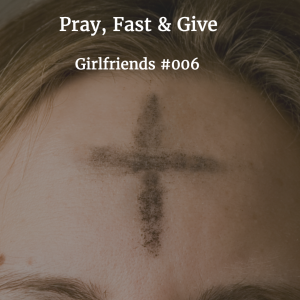 To get you started, we share dozens of ideas on the themes of Pray, Fast & Give. In this week’s interview, we talk with the awesome Sarah Reinhard. Sarah shares some inspiring advice for trusting in God more, and also tells us a hilarious story of something crazy she recently did at a junior high school basketball game. Sarah is always a joy to talk to! This week’s shout-out goes to Christine. Christine’s friend Georgianne wrote to tell me about how Christine, a single mom, recently completed coursework and became certified to become an elementary school teacher. Christine has worked hard and made many sacrifices to plan a better life for herself and her children. So GREAT JOB, Christine! We are so proud of you! This week’s challenge is to think about the themes of Praying, Fasting & Giving that we talked about (as well as some of your own) and choose one small thing to try in each of these categories this Lent. Let me know what you choose and keep me posted on how it goes for you! Thanks SO MUCH to listeners Samjmj, Frustrated basketball fan, Melissajo, Motherswagyolo, and Semper Paratus for reviewing Girlfriends on iTunes this week. I would love it if you would consider doing the same, rating and/or reviewing Girlfriends in iTunes to help me get the word out about this new podcast. Thanks again for the opportunity to run my mouth, Danielle, and for all you do!!! Sarah, I listened to you yesterday when I was on the road. Such a fun, great interview!